I really don’t see anything unique in what Twine has released so far. ClearForest, for example, has offered a Firefox add-on that does the same entity extraction for any web page that your Twine screenshot illustrates, and they had that available several months ago. 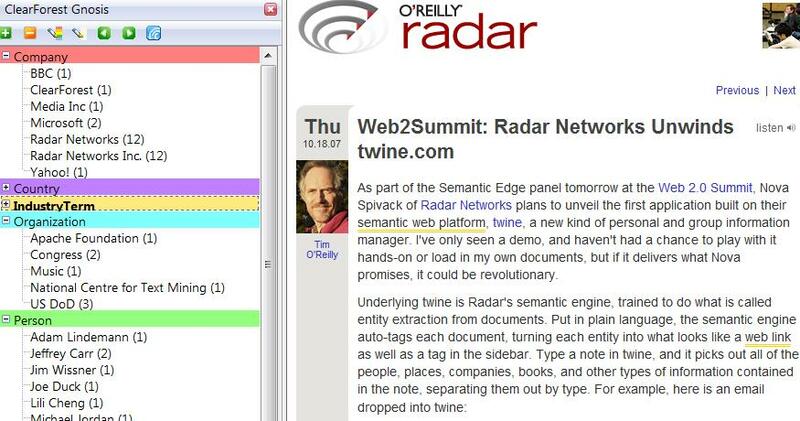 Like Tim O’Reilly I’ll reserve judgment on Twine until I’ve tried it myself, and seen it operate at scale. I did, however, recently try the Firefox extension that Jeffrey Carr mentions. It’s called Gnosis, from ClearForest, a company recently acquired by Reuters. I’d love to see this kind of entity extraction turn into a commodity service that we can wire into our existing email, blogging, social networking, and social bookmarking systems. Being able to easily express, in all those contexts, that twine refers to the company, or the product, not the strong kind of string, would be a huge win. Author Jon UdellPosted on 25 Oct 2007 Categories . > networking, and social bookmarking systems. At Orchestr8, we’ve been bringing Entity Extraction and other text mining capabilities “into the cloud”. Developers can utilize our REST api or SDKs to integrate natural language processing capabilities into their apps. 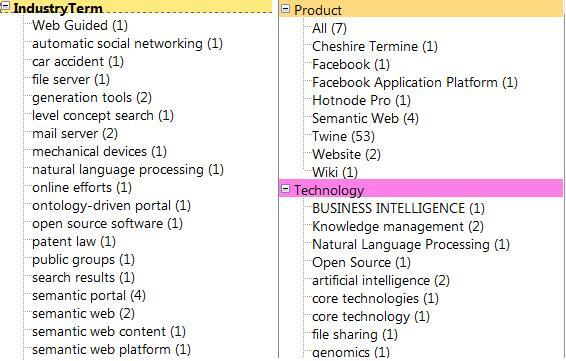 AlchemyAPI supports 6+ spoken languages (English, French, ..), extraction of dozens of entity types, disambiguation support, text classification, etc. Other worthwhile Entity Extraction solutions include those from BasisTech and Teragram.